In 2017, San Francisco International Airport set an ambitious goal for sustainability: to become the world’s first zero waste airport by 2021. That means at least 90 percent of waste generated at the airport needs to be diverted away from landfills and incinerators. Through existing sorting efforts, SFO recorded a respectable 57 percent diversion rate in the year between July 2015 and June 2016. But a more recent audit of the airport’s bins and trash compactors revealed a significant problem: a great deal of easily recyclable and compostable materials generated by concessions and retail purchases was still landing in the bin headed for the landfill. If the team at SFO is to reach its zero waste goal in the next three years, the airport's facilities must be able to efficiently sort out these renewable or reclaimable materials. But if these items are consistently ending up in the wrong bin, then the point of failure in the system seems obvious: the airport just needs better bins. SFO's existing (and often mismatched) sorting bins. Image by Gensler. To improve their design, we first looked at all the ways the receptacle itself could encourage passengers to sort their waste, starting with a stock receptacle that could easily be arranged into a tight footprint and reduce floor clutter. With input from SFO’s operations and custodial teams, we established some basic performance metrics for size, capacity, and ease of maintenance. To help with sorting accuracy, we created a combination of graphic and non-graphic visual cues. We developed custom symbols along with illustrations depicting appropriate items for each receptacle. To further distinguish each stream, we used unique colors and created distinctly shaped lid openings. As the product design took shape, our Brand Design team created prototype versions to conduct on-site testing and gauge the effectiveness of our proposed messaging solutions. To maximize our sample pool, we field tested half a dozen variants in various locations around the airport over a three-week period. We observed passengers in the international and domestic terminals interacting with each prototype, then conducted follow-up intercepts to gauge their reactions and gain further insights. A trio of prototype bins sits outside a security checkpoint during testing. Image by Gensler. We learned that, in our sample pool at least, passengers need multiple layers of information in order to choose the appropriate waste stream in a timely manner. Studies have shown that people only spend about seven seconds making these kind of decisions, so it is imperative to give passengers the right mix of visual and textual cues for quick understanding and the highest level of sorting accuracy. 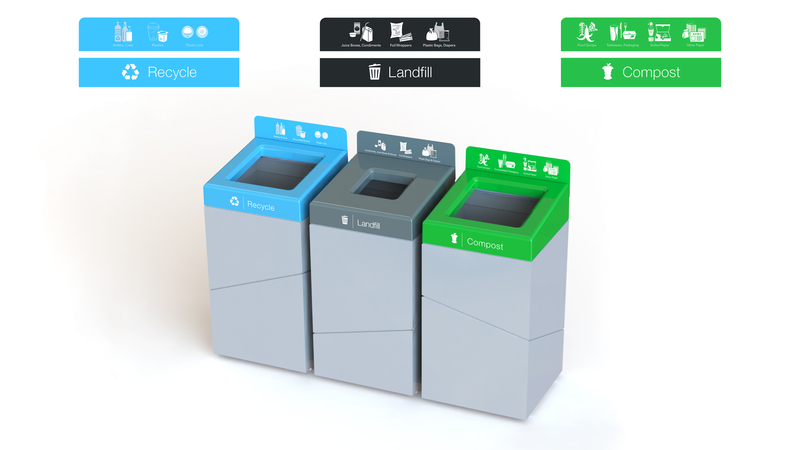 Finally, we improved the functional performance of the bins themselves by choosing a different base receptacle and making several custom alterations to the product design. The result is trio of receptacles that are functional, ergonomic, and clearly legible. They’ve even been turning heads around the airport, catching the attention of everyone from United Airlines to local artisan groups and universities, who have all expressed an interest in procuring their own versions. 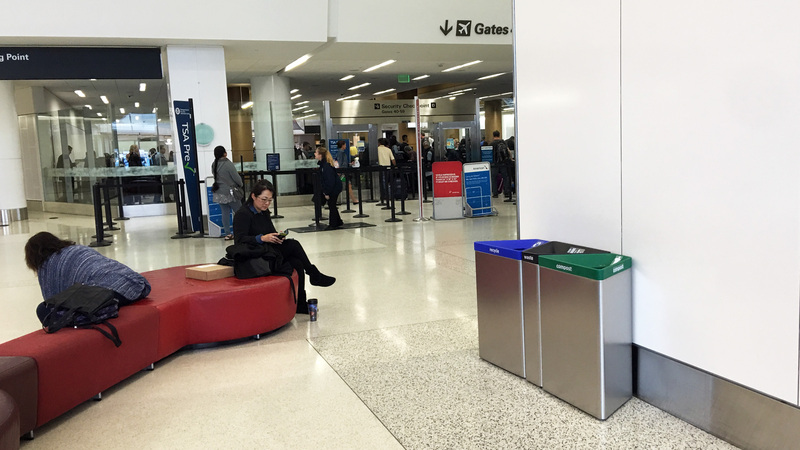 And, as a final bonus, SFO’s worn-out, disorganized, and often incorrectly identified old bins could be recycled themselves — gaining a new life as they’re recast with better functionality and a fresh look. Gensler's final design prioritizes clear colors and simple visual cues. Image by Gensler. As of 2017, SFO’s diversion rate was around 70 percent, but closing that final gap will largely depend on passengers’ ability to do more sorting on their own. With a thoughtful design strategy, the airport will likely breeze past that ambitious zero waste goal, while also serving as an educational space that leaves passengers with an impression of the airport, the city, and the state’s commitment to a sustainable future. Rather than leaving something behind in California’s landfills, the tens of millions of passengers who pass through SFO every year can carry on those values to their final destination.